A novice crafter's journey creating twelve crafts (one per month) before Christmas 2010.
i like to party at . . . Here's a little recap of what we've covered so far in the pretend and play set. 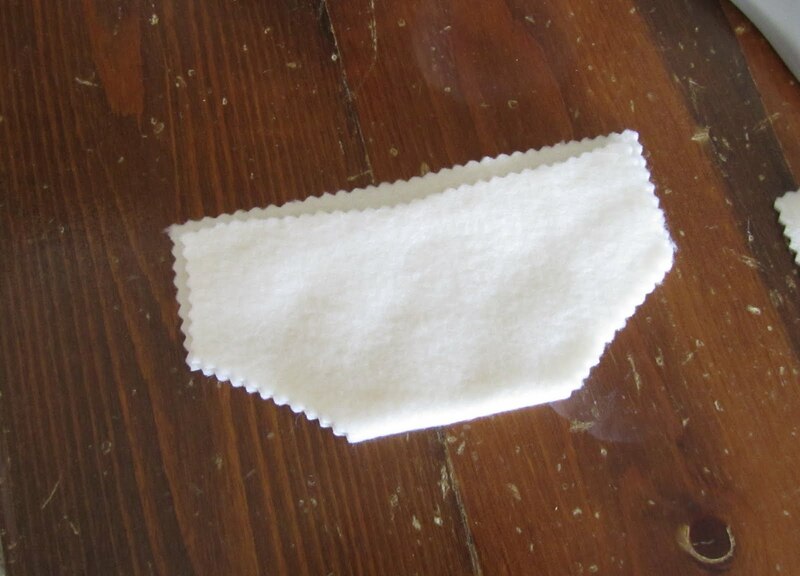 And little wipes need little diapers, so in an effort to complete the pair . . .
-pinking shears, sewing machine, etc. These diapers fit our sweet little 11 to 13 inch dolls. Adjust measurements for your dollies. 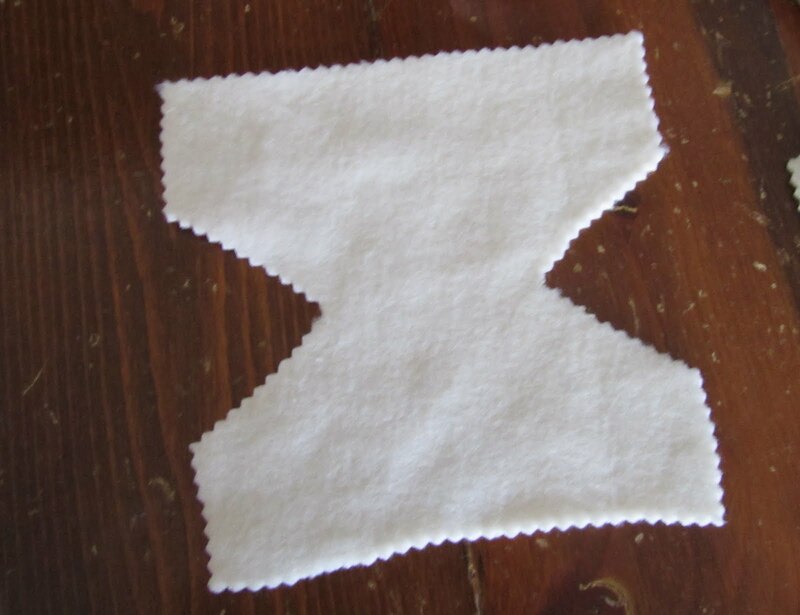 1) Cut a 5 1/2 by 5 1/2 inch square with pinking shears (again, don't forget to adjust diaper size for doll size). 2) Fold bottom of square up to almost to top of square leaving about 1/4 inch from top edge. At this point, I also cut a bit of a dip in the front of the diaper. 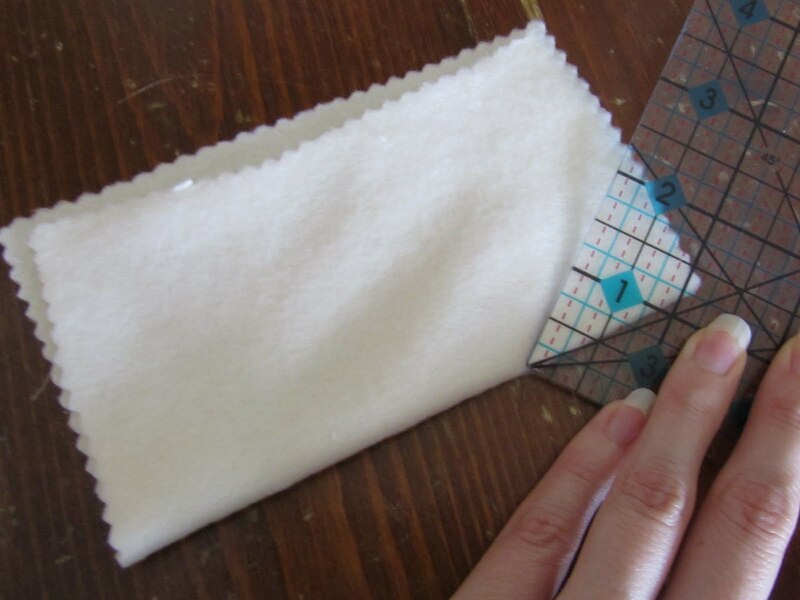 3) Cut a triangle off each of the bottom corners that measures about two inches on the diagonal. 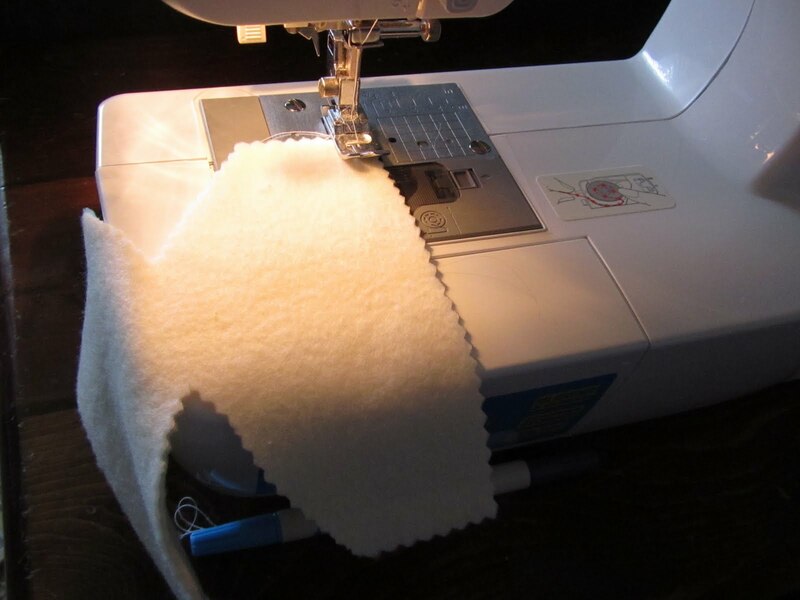 4) Using a long stitch on your sewing machine, sew a straight line at the top of the backside of the diaper. Do not back stitch on either end. 5) Pull one of the threads to make a slight gather in the diaper back. Tie ends off on both sides. 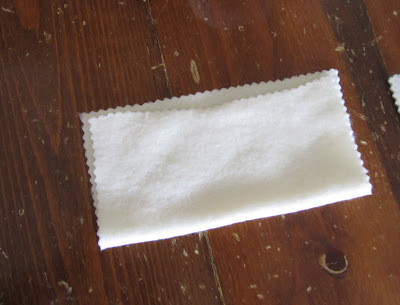 6) Place elastic over the gathered thread and sew onto diaper. 7) Sew on small strips of hook and loop as as the diaper tabs, and put on doll or tuck away in pretend and play diaper bag. So cute and easy! I'm thinking that these are an appropriate Christmas gift for a little boy who is going to be a big brother in the spring, right? So cute! You make everything look so easy! These are so cute. I just today had my grandtwins and said I needed to make their babies some cloths and some diapers! Perfect timing. These are so so cute! Really Elizabeth - the set is amazing. I love all the details. Your girls are going to have such a good time playing with these!! I'm dying with all the cute stuff you are coming up with!! How simple and how *easy*. My little man was coveting our little neighbors baby doll over the weekend so I'm thinking that might be his birthday gift... we'll see how my husband feels about that! Those are just too cute. Thank you so much. My daughter would love these! Brilliant! You should come link this up at Making It With Allie! Hi! I'm Lindsay a new follower of your blog! What a cute idea! Gonna have to make some of those. THanks for the great idea!! 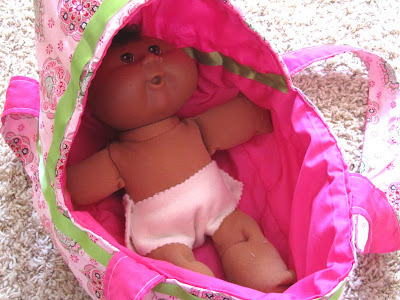 Thanks for the easy doll diaper tutorial! OMG! Thank you so much for posting this. I was thinking just today that I needed to make some for my little girl! Found this through NightOwl's Hoo's Got Talent. I love this and the wipes idea! Can't wait to make some for my kiddo for Christmas! Wow! Thank you so much! These would be a great idea for presents for Christmas. Thanks for sharing. I will be linking to your great projects. What a brilliant and simple idea you came up with. Most dolly diapers are unnecessarily complicated and my daughter can't figure out how they go on. "The elastic goes in the back" will be our new catch phrase. :-) Thank you for sharing these with us! Way cute! My daughter, when she was little, actually did a lot of "hand sewing" for her doll things similar to you. That was the way she started out! Although my housework is going to suffer! I try to teach my kids good manners. I'm not sure how successful I've been though. But when I hear them say "please" or "thank you", I know my persistence is paying off. I try to use good manners on my blog too . . . giving credit where credit is due by linking back to projects or ideas from other crafty bloggers. I ask you to do the same. If, in some rare instance, you are inspired enough to blog about something I tried or use an idea you find here, please link back to me (if it's my idea) or the original blogger. Feel free to use my original ideas and tutorials for personal use only (gifts or self) not for profit! twelve crafts till Christmas by Elizabeth @ twelve crafts is licensed under a Creative Commons Attribution-NonCommercial-NoDerivs 3.0 Unported License. have you ever had a night like this? sunday kids' craft: buttons of fun! Today Might Just Be the Day…. what else are you looking for @ twelvecrafts?